A quick and easy way to blackout your Toyota 4Runner Emblems using an overlay kit from Nox Lux. Available for 5th Gen 4Runners, Tacomas and Tundras as well! One of the easiest and quickest modifications you can do to your 5th Generation Toyota 4Runner is emblem blackout mod. The 4Runner Emblem Blackout mod is also one of the most visually appealing mods. A growing trend in the automotive industry is using blackout emblems directly from the factory. Unfortunately, Toyota is still selling the 4Runners with chrome logos off the lot. On the long list of mods I’ve done to my 4Runner TRD PRO, one of my favorites to date is the emblem blackout mod. I actually ordered the kit before I even took delivery of my vehicle! There are some people who prefer the DIY version of this mod, which usually involves painting the original emblems using plasti-dip (Plasti Dip® – PLASTI DIP®). This option leaves a little more room for error since it involves removing the original emblems for painting or masking off the painted area. Ultimately, this takes a good amount of work to get it done well. The easier route is to use an emblem overlay kit. The emblem overlay kits are designed to stick directly on top of the OEM factory logos. These blackout emblems stick on using double-sided tape, so the install is as easy as cleaning the surface of your factory logos and sticking on the blackout kit. Nox Lux is a retailer making blackout emblem kits for 5th Gen 4Runners, Tacomas, Tundras and more. The emblem overlays from Nox Lux are lightweight and fit securely to the factory OEM logos on your vehicle. 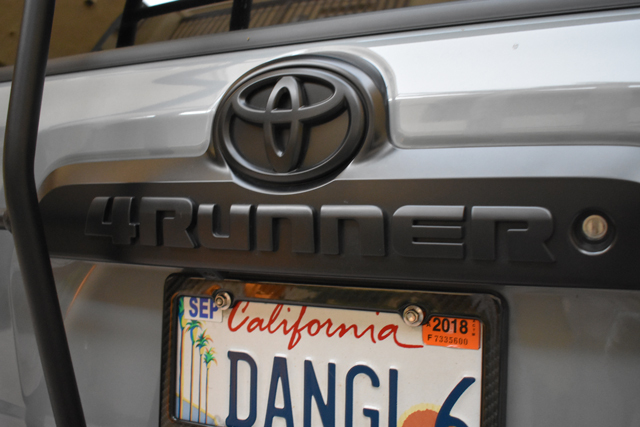 Please Note: The 5th Gen Toyota 4Runner TRD PRO Model comes with blackout emblems direct from the factory, however only the front Toyota Logo, Rear TRD PRO and side TRD PRO logos come blacked out. From the factory, the rear Toyota Emblem and 4Runner text come in chrome. I purchased the 2014-2018 4Runner SR5 kit for my TRD PRO to get the rear logo and text and ended up gifting the extra SR5 and logos to a fellow 4Runner owner. Nox Lux blackout emblems are available directly from Nox Lux on their website at www.nox-lux.com or available through Amazon.